The beliefs in the sapta loka of the Brahminical religion has remained faithful to the archaic philosophy; and – who knows – but the idea itself was originated in Aryavarta, this cradle of all philosophies and mother of all subsequent religions! If the Egyptian dogma of the metempsychosis or the transmigration of soul taught that there were seven states of purification and progressive perfection, it is also true that the Buddhists took from the Aryans of India, not from Egypt, their idea of seven stages of progressive development of the disembodied soul, allegorized by the seven stories and umbrellas, gradually diminishing towards the top on their pagodas. The seven planetary spheres served as a model for state divisions and organizations. China was divided into seven provinces; ancient Persia into seven satrapies. According to the Arabian legend seven angels cool the sun with ice and snow, lest it should burn the earth to cinders; and seven thousand angels wind up and set the sun in motion every morning. The two oldest rivers of the East – the Ganges and the Nile – had each seven mouths. The East had in the antiquity seven principal rivers (the Nile, the Tigris, the Euphrates, the Oxus, the Yaksart, the Arax and the Indus); seven famous treasures; seven cities full of gold; seven marvels of the world, &c. Equally did the number seven play a prominent part in the architecture of temples and palaces. The famous pagoda of Churingham is surrounded by seven square walls, painted in seven different colours, and in the middle of each wall is a seven storied pyramid; just as in the antediluvian days the temple of Borsippa, now the Birs-Nimrud, had seven stages, symbolical of the seven concentric cycles of the seven spheres, each built of tiles and metals to correspond with the colour of the ruling planet of the sphere typified. These are all “remnants of paganism” we are told – traces “of the superstitions of old, which, like the owls and bats in a dark subterranean, flew away to return no more before the glorious light of Christianity” – a statement but too easy of refutation. If the author of the article in question has collected hundreds of instances to show that not only the Christians of old but even the modern Christians have preserved the number seven, and as sacredly as it ever was before, there might be found in reality thousands. To begin with the astronomical and religious calculation of old of the pagan Romans, who divided the week into seven days, and held the seventh day as the most sacred, the Sol or Sunday of Jupiter, and to which all the Christian nations especially the Protestants – make puja to this day. If, perchance, we are answered that it is not from the pagan Romans but from the monotheistic Jews that we have it, then why is not the Saturday or the real “Sabbath” kept instead of the Sunday, or Sol’s day? If in the “Rámáyana” seven yards are mentioned in the residences of the Indian kings; and seven gates generally led to the famous temples and cities of old, then why should the Frieslanders have in the tenth century of the Christian era strictly adhered to the number seven in dividing their provinces, and insisted upon paying seven “pfennigs” of contribution? The Holy Roman and Christian Empire has seven Kurfursts or Electors. The Hungarians emigrated under the leadership of seven dukes and founded seven towns, now called Semigradyá (now Transylvania). If pagan Rome was built on seven hills, Constantinople had seven names – By-sance, Antonia, New Rome, the town of Constantine, The Separator of the World’s Parts, The Treasure of Islam, Stamboul – and was also called the city on the seven Hills, and the city of the seven Towers as an adjunct to others. With the Mussulmans “it was besieged seven times and taken after seven weeks by the seventh of the Osman Sultans.” In the ideas of the Eastern peoples, the seven planetary spheres are represented by the seven rings worn by the women on seven parts of the body – the head, the neck, the hands, the feet, in the ears, in the nose, around the waist – and these seven rings or circles are presented to this time by the Eastern suitors to their brides; the beauty of the woman consisting in the Persian songs of seven charms. The seven planets ever remaining at an equal distance from each other, and rotating in the same path, hence, the idea suggested by this motion, of the eternal harmony of the universe. In this connection the number seven became especially sacred with them, and ever preserved its importance with the astrologers. The Pythagoreans considered the figure seven as the image and model of the divine order and harmony in nature. It was the number containing twice the sacred number three or the “triad,” to which the “one” or the divine monad was added: 3 + 1 + 3. As the harmony of nature sounds on the key-board of space, between the seven planets, so the harmony of audible sound takes place on a smaller plan within the musical scale of the ever-recurring seven tones. Hence, seven pipes in the syrinx of the god Pan (or Nature), their gradually diminishing proportion of shape representing the distance between the planets and between the latter and the earth – and, the seven-stringed lyre of Apollo. Consisting of a union between the number three (the symbol of the divine triad with all and every people, Christians as well as pagans) and of four (the symbol of the cosmic forces or elements), the number seven points out symbolically to the union of the Deity with the universe; this Pythagorean idea was applied by the Christians – (especially during the Middle Ages) – who largely used the number seven in the symbolism of their sacred architecture. So, for instance, the famous Cathedral of Cologne and the Dominican Church at Regensburg display this number in the smallest architectural details. To attempt to cite all the things included in this mystical number would require a library. We will close by quoting but a few more from the region of the demoniacal. According to authorities in those matters – the Christian clergy of old – a contract with the devil had to contain seven paragraphs, was concluded for seven years and signed by the contractor seven times; all the magical drinks prepared with the help of the enemy of man consisted of seven herbs; that lottery ticket wins, which is drawn out by a seven-year old child. Legendary wars lasted seven years, seven months and seven days; and the combatant heroes number seven, seventy, seven hundred, seven thousand and seventy thousand. The princesses in the fairy tales remained seven years under a spell, and the boots of the famous cat – the Marquis de Carabas – were seven leagued. The ancients divided the human frame into seven parts; the head, the chest, the stomach, two hands and two feet; and man’s life was divided into seven periods. A baby begins teething in the seventh month; a child begins to sit after fourteen months (2 X 7); begins to walk after twenty-one months (3 X 7); to speak after twenty-eight months (4 X 7); leaves off sucking after thirty-five months (5 X 7); at fourteen years (2 X 7) he begins to finally form himself; at twenty-one (3 X 7) he ceases growing. The average height of a man, before mankind degenerated, was seven feet; hence the old Western laws ordering the garden walls to be seven feet high. The education of the boys began with the Spartans and the old Persians at the age of seven. And in the Christian religions – with the Roman Catholics and the Greeks – the child is not held responsible for any crime till he is seven, and it is the proper age for him to go to confession. If the Hindus will think of their Manu and recall what the old Shastras contain, beyond doubt they will find the origin of all this symbolism. Nowhere did the number seven play so prominent a part as with the old Aryas in India. We have but to think of the seven sages – the Sapta Rishis; the Sapta Loka – the seven worlds; the Sapta Pura – the seven holy cities; the Sapta Dvipa--the seven holy islands; the Sapta Samudra--the seven holy seas; the Sapta Parvatta – the seven holy mountains; the Sapta Arania--the seven deserts; the Sapta Vriksha--the seven sacred trees; and so on, to see the probability of the hypothesis. The Aryas never borrowed anything, nor did the Brahmans, who were too proud and exclusive for that. 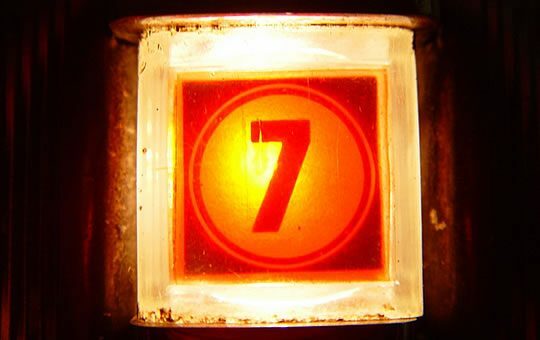 Whence, then, the mystery and sacredness of the number seven?